To an untrained ear, the term “vortex flowmeter” may conjure futuristic, potentially Star Wars inspired images of a hugely advanced machine meant for opening channels in warp-space. In reality, vortex flowmeters are application specific, industrial grade instruments designed to measure an important element of a fluid process control operation: flow rate. Vortex flowmeters operate based on a scientific principle called the von Kármán effect, which generally states that a fluid flow will alternately shed vortices when passing by a solid body. “Vortices” is the plural form of vortex, which is best described as a whirling mass, notably one in which suction forces operate, such as a whirlpool. Detecting the presence of the vortices and determining the frequency of their occurrence is used to provide an indication of fluid velocity. The velocity value can be combined with temperature, pressure, or density information to develop a mass flow calculation. Vortex flowmeters exhibit high reliability, with no moving parts, serving as a useful tool in the measurement of liquid, gas, and steam flow. While different fluids present unique challenges when applying flowmeters, steam is considered one of the more difficult to measure due to its pressure, temperature, and potential mixture of liquid and vapor in the same line. Multiple types of steam, including wet steam, saturated steam, and superheated steam, are utilized in process plants and commercial installations, and are often related to power or heat transfer. Several of the currently available flow measurement technologies are not well suited for steam flow applications, leaving vortex flowmeters as something of a keystone in steam flow measurement. Rangeability, defined as a ratio of maximum to minimum flow, is an important consideration for any measurement instrument, indicating its ability to measure over a range of conditions. Vortex flowmeter instruments generally exhibit wide rangeability, one of the positive aspects of the technology and vortex based instruments. The advantages of the vortex flowmeter, in addition to the aforementioned rangeability and steam-specific implementation, include available accuracy of 1%, a linear output, and a lack of moving parts. It is necessary for the pipe containing the measured fluid to be completely filled in order to obtain useful measurements. Applications where the technology may face hurdles include flows of slurries or high viscosity liquids. These can prove unsuitable for measurement by the vortex flowmeter because they may not exhibit a suitable degree of the von Kármán effect to facilitate accurate measurement. Measurements can be adversely impacted by pulsating flow, where differences in pressure from the relationship between two or more compressors or pumps in a system results in irregular fluid flow. When properly applied, the vortex flowmeter is a reliable and low maintenance tool for measuring fluid flow. 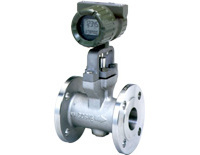 Frequently, vortex flow velocity measurement will be incorporated with the measurement of temperature and pressure in an instrument referred to as a multivariable flowmeter, used to develop a complete measurement set for calculating mass flow. Whatever your flow measurement challenges, share them with a flow instrument specialist, combining your process knowledge with their product and technology expertise to develop effective solutions. Digital Vortex Flowmeters From Yokogawa from Classic Controls, Inc.